Nothing sets a home apart like a custom handcrafted wooden entrance door from Turtle River Millwork. The durable beauty of natural solid wood creates a look of distinction that will last for generations. And our unlimited custom design possibilities make every one of our exterior wood doors a unique signature statement that reflects the character and values of the owner. 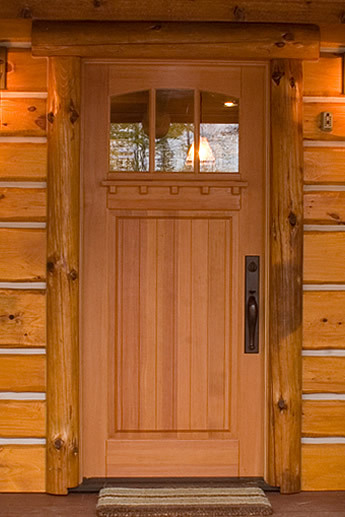 Each of our custom exterior doors is handmade using the finest solid wood and engineered components. Some of the more beautiful and popular wood choices for custom exterior door applications include red oak, cherry, mahogany, walnut and quarter sawn white oak. We have reclaimed wood and many other options available as well. If you have something unique in mind, give us a call and we’ll do our best to find it for you. Custom 3D carving is an option for any of our exterior door designs. We can create a carved image from your artwork or photo, or tell us what you have in mind and we will design an image to suit. All our custom exterior door designs come pre-hung on an exterior jamb. Top-quality seals, adjustable sill and entry door hardware are included with each order. We ship doors to any location in the continental United States. 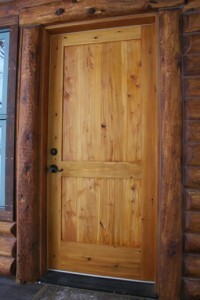 Ready to explore handcrafted door possibilities to complement your home, camp or cabin? To find out more about the custom exterior door you are interested in, or to speak with a Turtle River Millwork design specialist, contact us here.